Pianist Roberta Piket's brilliantly realized "One for Marian: Celebrating Marian McPartland" is a revelatory sextet project that shines a warm, loving light on the extraordinary but underappreciated body of work by Piket's late friend and mentor. Though McPartland was eulogized in 2013 as a supremely elegant jazz stylist and beloved public radio host, her output as a composer has largely been overlooked--a situation Piket intends to rectify with her fine new CD. 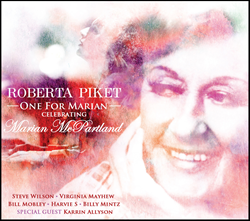 "One for Marian: Celebrating Marian McPartland," the new CD by pianist Roberta Piket. Marian always felt regretful that her tunes weren't played more. She felt a little unrecognized in that regard. She wrote so many great tunes. Marian McPartland’s creative output as a composer has been quite overshadowed by the late piano legend’s decades-long role as a beloved public radio host. 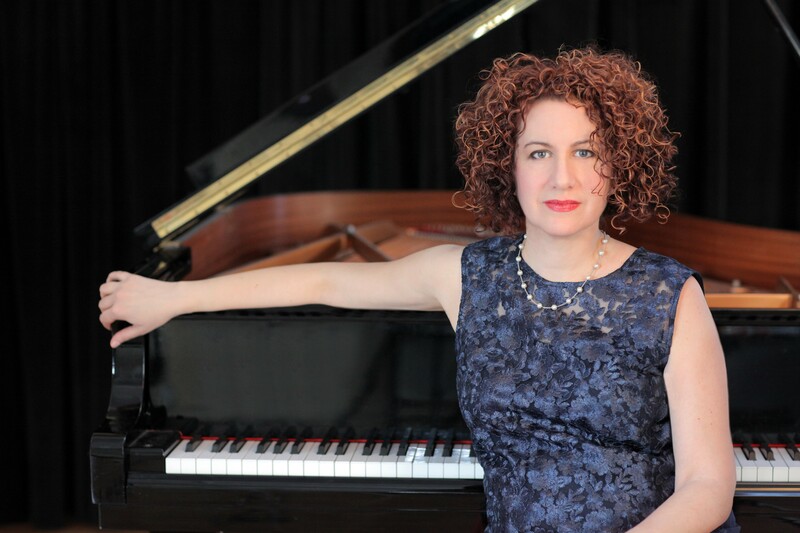 Pianist Roberta Piket aims to help put that right with her new album "One for Marian: Celebrating Marian McPartland," to be released by Thirteenth Note Records on June 10. An uncommonly probing improviser in both free and straight-ahead settings, Piket has garnered considerable attention in recent years with a pair of enthralling solo piano recordings. But on "One for Marian" she returns to a larger ensemble format. The album’s cast couldn’t be better equipped to interpret Piket’s lush arrangements and McPartland’s melodically charged compositions. Featuring Steve Wilson on alto sax and flute, Virginia Mayhew on tenor sax and clarinet, Bill Mobley on trumpet and flugelhorn, bassist Harvie S, and drummer and percussionist Billy Mintz, "One for Marian" grew out of a concert that Piket performed at the 2014 Wall Street Jazz Festival. The album opens with “Ambiance,” a haunting melody full of thick, mysterious harmonies. “In the Days of Our Love,” a McPartland tune so lovely that Peggy Lee felt inspired to write lyrics for it, features exquisite solos by Mobley and Mayhew, who croon the bittersweet melody with their horns. Piket first recorded McPartland’s loving portrait of Mary Lou Williams, “Threnody,” on her debut album in a trio context, while this quartet version showcases Wilson’s expressive flute work. Piket also offers two pieces of her own in honor of McPartland—the title track, a briskly swinging number with an intricate melodic line that features some particularly tasty drum work by Mintz, and “Saying Goodbye,” an elegiac caress of a farewell. Fittingly, Piket closes the album with her lively arrangement of McPartland’s “Kaleidoscope,” the theme song for NPR’s Piano Jazz, which leaves listeners wanting more while summoning the salty spirit of jazz’s grande dame. "One for Marian" is something of a departure for Piket as her first album dedicated to the work of another composer. From the early stages of her career, she’s distinguished herself as a gifted writer (she placed second in the 1993 Thelonious Monk BMI Composers Competition). Over the years, Piket has performed as a sidewoman with many of jazz’s greatest figures, including David Liebman, Rufus Reid, Michael Formanek, Lionel Hampton, Mickey Roker, Eliot Zigmund, Benny Golson, and Ted Curson. Born in Queens, New York (1965), Roberta Piket inherited a passion for music from both of her parents. Her father was the Austrian composer Frederick Piket, who made significant contributions to both the musical liturgy of Reform Judaism and the concert hall with works performed by the New York Philharmonic under conductor Dimitri Metropolis. From her mother, Cynthia, she absorbed the glories of the American Songbook, learning by ear the tunes of Porter, Gershwin, Kern, Rodgers, and Berlin (as well as the accompanying lyrics). Piket attended the joint five-year double-degree program at Tufts University and New England Conservatory, graduating with a degree in computer science at the former and a degree in jazz piano from the latter. After a year as a software engineer, however, she realized that her calling was music, and she returned to New York, where an NEA grant set her up to study with pianist Richie Beirach. Marian McPartland heard the young pianist at the Thelonious Monk Composers Competition and invited her to appear as a featured guest on NPR’s Piano Jazz, Piket’s first of three appearances on the show. Beginning with Piket’s first recording under her own name, 1996’s "Unbroken Line" (Criss Cross) with Donny McCaslin and Michael Formanek, she’s recorded McPartland’s music. With "One for Marian," she makes an incontrovertible case for the enduring beauty of McPartland’s compositions. Roberta Piket will be performing several CD release shows in the NYC area, beginning with 6/4 IBeam Brooklyn (full band from the CD, with Shunzo Ohno replacing Mobley); then 6/10 Trumpets, Montclair, NJ (full band, with Anton Denner replacing Wilson); 7/14 Mezzrow, NYC (duo with Steve Wilson); and 9/8 Smalls, NYC (full band, with alto sax TBD).